The large black curtain covering the famed Jaffa Gate of the Old City of Jerusalem was removed today at official Jaffa Gate Rededication Ceremony. The large black curtain covering Jaffa Gate, one of the two most famous gates leading in and out of the Old City of Jerusalem, was removed this morning at the official Jaffa Gate Rededication Ceremony. 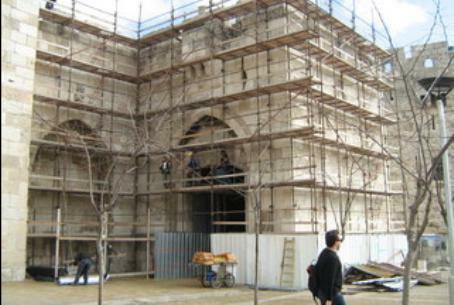 The celebrated large stone entrance underwent two months of preservation work, in the framework of a program to refurbish the Old City walls. The work was carried out by the Israel Antiquities Authority (IAA), underwritten by the Jerusalem Development Authority and the Prime Minister’s Bureau. Present at the ceremony were Jerusalem Mayor Nir Barkat, Jerusalem Development Authority director Moshe Leon, and IAA director Shuka Dorfman. The current walls of the Old City were built mainly by Sultan Suleimon of the Ottoman Empire in the 16th century. The current refurbishing work, which began three years ago, seeks to repair the damages of the ravages of time and neglect. At Jaffa Gate, large boulders and stones were strengthened, bullet marks were demarcated, designs and ornaments were restored, and the entire gate was cleaned. Jaffa Gate was first dedicated in 1538, but only some 110 years ago did it become a flourishing and dynamic center of activity. In 1898, it was decided to break through the wall, adjacent to Jaffa Gate, to allow Kaiser Wilhelm II and his wife Augusta Victoria to enter the city in their chariot. It marked the first time in modern history that wagons were able to enter the Old City. During the War of Independence (1948-9), Jaffa Gate was a focal point of difficult battles between the fledgling Israeli forces and the Jordanian Legion. At one point during the war, the gate became totally blocked by an armored vehicle that was disabled by shooting and became stuck in the gate. The ceasefire agreement that followed the war determined that Jaffa Gate would mark the Jordanian end of the no-man’s land that began there and ended at today’s IDF Square, at the end of Jaffa Rd. The armored car remained stuck where it was and Jaffa Gate remained closed until the end of the 1967 Six Day War, when Israel liberated the entire city of Jerusalem for the Jewish People.